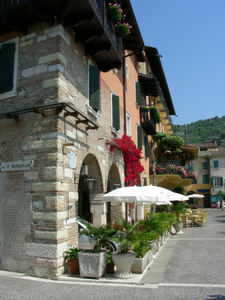 "Torri del Benaco is a very historic lakeside town, full of charm and character"
Torri del Benaco is the ancient capital of Lake Garda and is a lovely town well worth seeing. Situated about half way up the east coast, it is an ideal base to explore both the north and south of the lake. You get lovely views from here across the lake and the town is big enough to have plenty to offer without being too large to walk right around it. The port area is our favourite part of Torri, surrounded by lovely hotels and restaurants with the wall of the castle behind. It is a particularly charming and tranquil spot and a favourite place for many to relax and enjoy a drink or bite to eat. 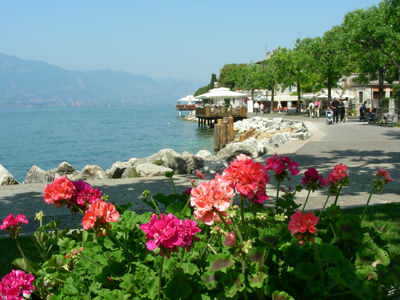 It is also a short walk to the ferry terminal where you can catch a boat to almost anywhere on the lake. There is a small beach here, but the main attraction is the town itself. 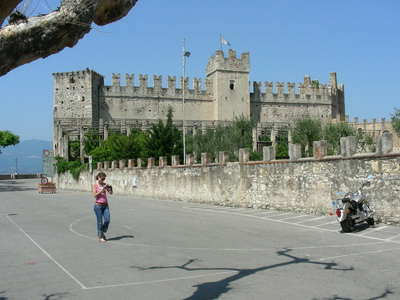 You can't miss the castle that dominates the town with its typical turrets and high walls. 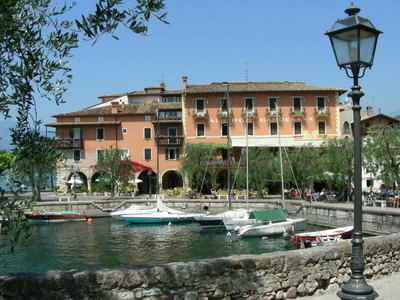 You will find lots of lakeside eating places and the streets leading away from the lake have a nice selection of shops to browse around in. There is a large car park here (close to the castle) which is useful, as many towns only have parking spaces on the side of the road. As with anywhere on the lake, don't risk not getting a parking ticket because the traffic wardens here are very keen!